The plight of the Francophile is that, more often than not, he or she doesn’t live in France. In fact, it’s quite possible that he or she has never even been to France, or at least, not with any frequency. But because separation makes the heart grow fonder (and sometimes downright obsessive), we must come up with coping mechanisms to keep the French dream alive, no matter where we are. If I were super-motivated, I’d be hosting regular French film soirées and presiding over a French lit-themed book club, but alas, that all sounds much too Type-A. For now, I will indulge in the little things that help me feel closer to the country where I really belong (and where I would be, if there were any justice in this world). 1. Tarragon Mustard. Maille whips up a delightful version, but I am partial to the Edmond Fallot variety, which I slather on whatever happens to be lying around. 2. Roger & Gallet products. Their Tilleul (Linden Blossom) moisturizing cream changed my life, and I will forever associate its scent with my cozy little studio on rue Mouffetard. Abroad, you can find these products in department stores and boutiques that carry high-end bath products. 3. 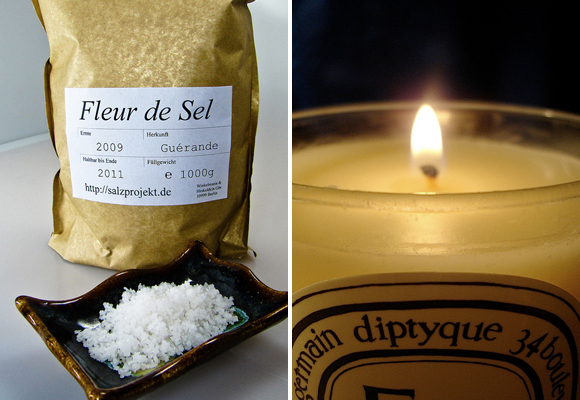 Fleur de Sel de Guérande. Keeping a container of this fancy sea salt in the kitchen ups the ante of just about any dish, and will inevitably impress your foodie friends. Sassy food blogger David Lebovitz explains why this salt is all it’s cracked up to be. 4.Diptyque candles. Yes, they’re $60 a pop in the United States, but they last for ages and manage to exude that understated elegance that you find in chic Parisian homes. The woodsy Baies scent (roses and black currant leaves) makes me want to hop the next plane to Paris (or just buy myself some housewarming gifts). 5. Crème de Cassis. It’s somewhat grandmotherly of me, but when in Paris, I get a kick out of perching at a zinc bar and ordering up a kir (white wine with a splash of cassis). 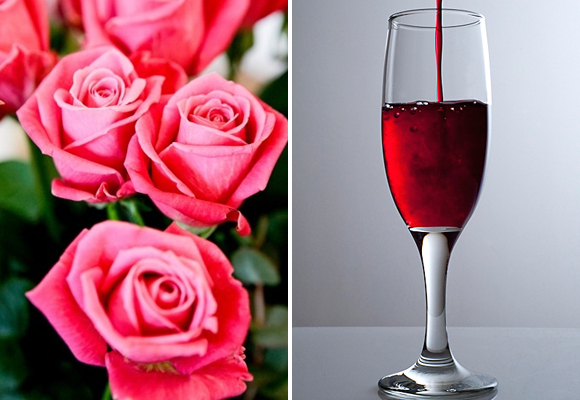 At home, I recreate the magic by keeping a bottle of the blackcurrant-flavored liqueur on hand. It’s the best way to liven up the cheap white wines I am (for budgetary reasons) forced to drink in the States. France, how I miss you! 6. Caudalie. 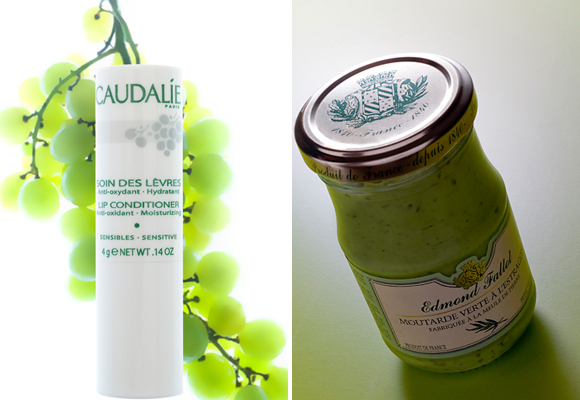 French women swear by this brand, whose natural products are infused with antioxidants derived from wine and grapes. Yum. Their “Soin des Levres” lip balm got me through multiple Parisian winters. 7. Flowers. The French did not invent flowers, but unsurprisingly, they use them to great effect. My living spaces tend to be fairly bare-bones, but introducing an overflowing vase of white peonies always adds the illusion of elegance (and an illusion is the best I can do for now). What about you, readers? What do you do to feel more “French” when you’re elsewhere in the world? Chilled Brouilly, a beige trench, tarte aux fruits too. I loved reading this article and all of the comments! I, too, immediately thought of butter. I have a long list but here are a few: a wonderful triple brie with french bread, my daughters and I have tons of scarves from Paris (and all over) and we wear them all of the time, speaking French when I have a chance,looking at my Paris maps and thinking about the neighborhoods I’ve stayed in, Google mapping areas of Paris and of course, looking at HIP properties and mentally planning my next trip. Thank you for such a great website, emails, etc. Oh. Butter. I so agree. We do have decent butter in my part of the world, really. But nothing beats beurre au lait cru, preferably with some fleur de sel added (demi-sel), from Normandy or Brittany. Slathered on a slice of baguette that’s pretty much all I need to be happy. (Fresh brioche from a boulangerie! Living an approx 550 km from the French border, I can’t help but dig into the first gorgeous brioche I see.) And then there is cassoulet (and haricots lingots). In those cold dark winter nights, I love to make cassoulet, with canned (French of course) confit de canard and haricots lingots. yum. When it’s warmer, I love to pack a french picnic. Bottle of wine, cheeses, baguette, apricot jam, pate, grapes and for dessert, macaroon cookies. Besides the basket of goodies, my husband and I will bring our folding wicker chairs, small table with table cloth and a good book to read after eating. I live in Miami, Florida… Perhaps one of the worse places to be a francophile. Paris essentials like scarfs, boots, umbrellas, and the french language are completely useless here because of the weather and culture, even umbrellas are rarely used because everyone drives everywhere! This post is honestly the story of my misplaced life!! pistaches – anything of that flavour or with it as an ingredient. The thing about macarons is that I had to try an infinite amount of times making macawrongs but alas I mastered the way, and their 100 times better than any of the whopping 3 places where I can find them in Miami. As for pistaches… Pistache macarons take me back immediately. I put out a board of small amounts of French cheeses and some Provençal olives. – ..and a long scarf wrapped just so…looking like it is not planned! Thank you for the invitation to feel a little more French! and relive the smells of my Meme’s kitchen by making escargot. It was not until I was in my 30s that I realized that the shells, canned snails, and the garlic and butter are easy and super cheap to make. I find it very amusing that the Fleur de Sel packaging is in German! Bonne Maman Figues Violettes confiture; Django Reinhardt on Spotify; Le Bon Marche macarons; carambars; Astier de Vilatte ceramics; Mariage Freres Chandernagor tea; French Elle (especially when not in France); French comic books. I agree with the good butter comment! I also adore my Hediard tea when I’m at home: instantly transports me back to a busy French cafe. i’d add butter to the list. the two things that keep me close to france even when i can’t get there are french butter and my nespresso machine. i know it’s swiss, but it makes a proper espresso and when i think of france i think proper espresso and butter.